This project was for a website for a historical Church with difficulty getting in touch with the community for membership and fundraisers. The new WordPress website was built using the Astra Theme and Elementor page builder with the Time.ly events calendar and ticketing system. The new ticketing system improved access to church event tickets, as the church office was only open a few days per week. 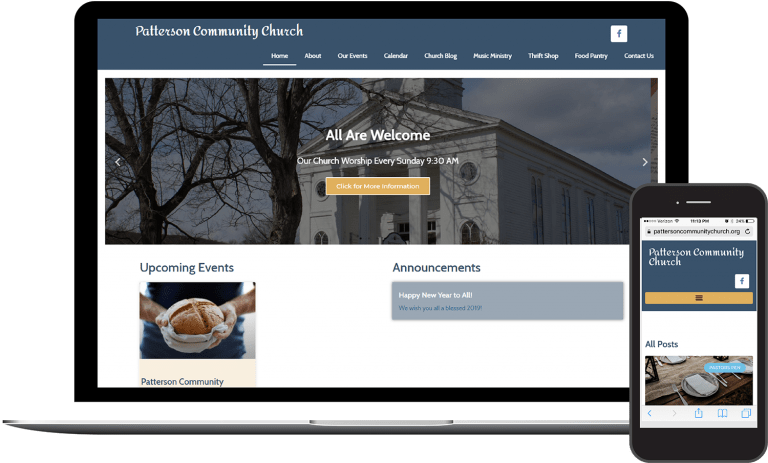 The church conducts multiple fundraisers and community events each season and maintains an active weekly blog and Facebook presence to provide outreach to all areas of the community. The new website also collects emails for direct marketing and Google Analytics is utilized to track key aspects of the website for ongoing digital marketing efforts (Facebook and direct promotions). Service also includes ongoing maintenance and software upgrades.